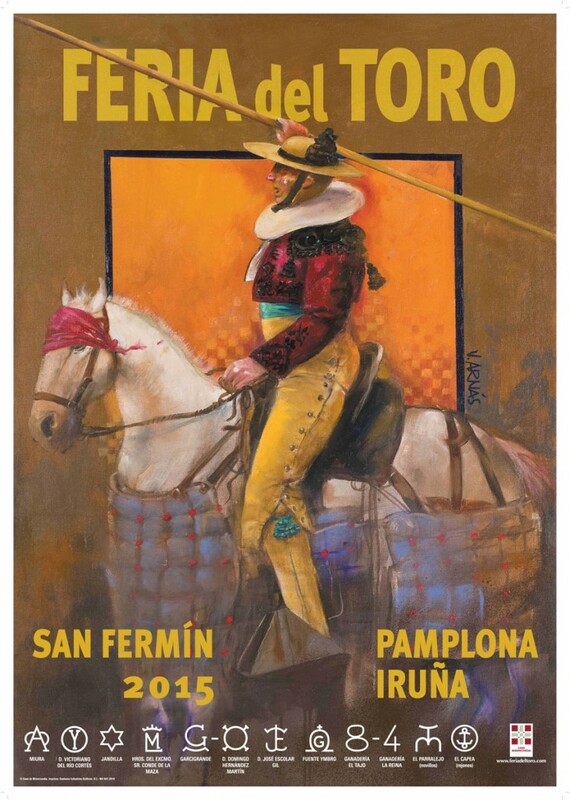 A horseback picador is the striking image on this year’s poster for the forthcoming Sanfermin 2015 Feria del Toro and today it was presented to the public at a press conference. This year the poster has been created by Madrid painter, Vicente Arnás who was chosen by the organizing committee from the Casa de Misericordia charity in Pamplona – the entity behind the organization of the bullfights – to provide the poster for this year. Not since 1986 has a picador featured on the annual poster made to announce the Sanfermin bullfighting week. And that is precisely why Vicente Arnás chose this particular assistant of the matador to feature on the poster “in order to find a poster theme that has not been given as much protagonism as some of the other elements within the bullfights”. The artist also revealed another interesting detail when he admitted that he had purposely omitted showing the steel stabbing point of the lance which is used to weaken the bull during the bullfight. And the reason for this omission he admitted was “to avoid hurting the feelings of those people who are opposed to the element of cruelty in the bullfight”. The Madrid painter also acknowledged that he was very pleased to have been chosen by the Casa de Misericordia committee to create the poster for this year`s bullfighting week. He revealed that he had also introduced some small details in the outfit and dress of the picador taken from earlier periods such as the frilly ruff around the neck of the picador, and he did this on purpose as this was something he had a habit of doing in his paintings in order to add some “personality to the piece”. At the press conference launching of the poster, Fernando Redón, a member of the Casa de Misericordia Bullfighting Committee, and also a fellow artist, spoke of the artistic validity found in the work of Arnás, and he outlined the career of this Madrid artist and the different exhibitions that he has had over the years. The Mayor of Pamplona, Enrique Maya, also spoke and he praised the rich variety and high quality found in the Sanfermin Bullfight posters over these past years. 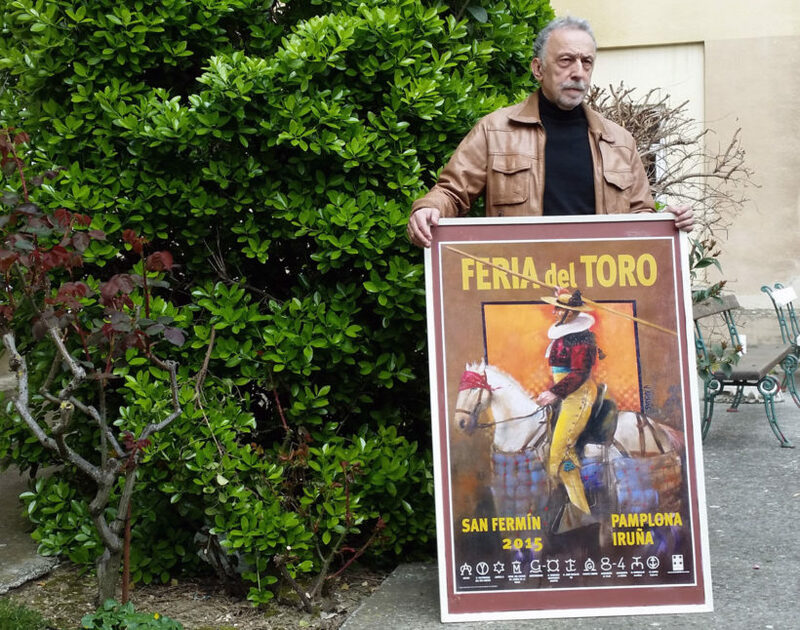 This official presentation of the Feria del Toro Poster is traditionally held just a few weeks before the annual presentation of the Sanfermin Fiestas Program. And the winner of this poster competition will soon be revealed after the general public of Pamplona has cast their votes for the winning poster, using this public-voting selection method which has been in vogue for several years now.